Shows what every leader must do to cope with perpetual change -- the key characteristic of twenty-first century business Provides unrivalled access to the best managed boardrooms in the world through unique interviews with some of today's most resilient and innovative leaders Combines inspirational anecdotes and case studies with solid, pracitcal advice Turbulent times are here to stay. The global recession is today’s current dramatic headline, but accelerating change and economic uncertainty are the hallmarks of twenty-first century business. Signs like the volatility of commodity prices and fluctuations in currencies are all part of a broader weather system affecting business everywhere. These powerful forces for change are the corporate equivalent of headwinds, something which must be faced and navigated by all leaders and those they lead. The challenge of the next few years is learning to maneuver confidentially in perpetual turbulence. So what should you do as a leader to keep your business on course? Kevin Kelly and Gary Hayes have interviewed frontline leaders with proven track records for adapting to rapid change and helping their companies thrive. 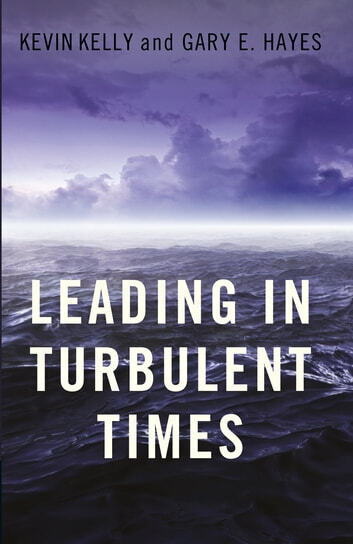 In Leading in Turbulent Times these extraordinary executives—from such successful international companies as McDonald’s, General Electric, Nissan, Coca-Cola, Kaiser Permanents, Marks & Spencer and more—share how they have confronted the challenges every leader must now face. 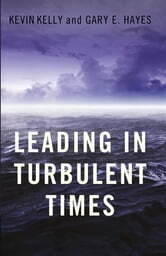 You’ll discover how to recognize the early signs of rough seas ahead and mobilize and inspire your people to respond. Kelly and Hayes explain what top leaders do to chart new strategies that build on existing strengths and, when necessary, change direction quickly and decisively. But a different course is not always welcomed by everyone, so Leading in Turbulent Times offers advice on putting down mutinies in ways that acknowledge legitimate concerns without distracting or alienating loyal crewmembers. And they focus on how to cope with the personal stress that comes with guiding your organization and your people through the turmoil. Leading in Turbulent Times shows how you can use change to your advantage, at a time when everyone else is being blown off course.